(See my other Food posts) – A couple of weeks ago we went to a French restaurant here in Singapore, Soufflé. The restaurant is located at 5 Duxton Hill, Singapore 089591. Soufflé is not a very large place and as you would expect from the name, it specializes in preparing a variety of soufflés. I had an order of Soupe à l’Oignon (Classic French onion soup with grantinated cheese toasts) then a Roquefort Cheese (Freshly baked soufflé – with a hearty portion of Roquefort cheese) and a Mixed green salad lightly dressed with French vinaigrette as my dinner. I liked all of those choices. The others in our party tried a wide variety of items and they enjoyed them all. You can look over their full menu if you like. There were six of us in the dinner party, so being the ‘crazy Americans’ that we are we ordered two of each! Well, actually three of the chocolate soufflé. Out of this delicious list, I liked the chocolate, caramel, and lime soufflés the best. I got too involved in the enjoying the soufflés so I did not get photos of them all. As you can see though, they all look good. I have to say that I much prefer eating at a restaurant with a good steak. This was an interesting dinner though and it was great to sample all of their dessert soufflés. If you like French cooking or soufflés, then you will enjoy this restaurant. I enjoyed reading this blog and wanted to share it. I have not had the opportunity to visit these biodomes yet myself, but I will definitely have them on my list when I return to Singapore next year. In one world, Alice ponders a giant mushroom inside an arid wonderland. Two rabbits mirror each other with claws up as if fighting their own reflections. The scent of flowers fills the air. In the lost world next door, a skyscraper sized waterfall beats against the ground. Mystical sculptures hide within a tangle of exotic plants. The paleolithic era of giant plants and vines weaves up a mountain. These are the Flower Dome and the Cloud Forest, two separate worlds encased in a half- moons of glass on the edge of Singapore’s Gardens by the Bay. Both magical and beautiful biodomes evoke an ancient, organic sensation nestled in with fairy tale and science fiction. Upon entering each world, it is as if you’ve been transported to an experimental outpost on Mars built by people with an interesting sense of humor. Food – A good friend here in Singapore recommended the Black Tap restaurant. We have now been there twice and have really enjoyed it. The Black Tap is located in the Marina Bay Sands Mall. Officially the address is 2 BAYFRONT AVE, SINGAPORE 018972. I didn’t realize it when I was there that the Black Tap is a chain of restaurants out of New York City. The Marina Bay Sands hotel and casino are shown above, with the Mall spread out at its base. The Black Tap is actually located at the near end of the Mall (building with the curved roof) shown in the photo above. It is one of the many shops and restaurants in the Mall. Notice at the bottom of the photo above you can see the ‘canal’ that goes through the center of this section of the Mall. It is complete with gondolas that you can purchase rides on. Exploring the Mall alone is worth a trip to the Marina Bay Sands. But we had come to the Mall specifically to dine. I chose the Steak Au Poivre Burger (a Blue Cheese Burger) with fries. It was very good. My wife had the Baja Grilled Chicken Sandwich with fries, which she enjoyed. While these, and the other items on the menu, were good, they were not why we visited the Black Tap. The Black Tap also specializes in Crazyshake Milkshakes. If memory serves me, we ordered the Cookies ‘N Cream Supreme Oreo Shake (vanilla frosted rim with crushed Oreos topped with a ‘cookies ’n cream’ sandwich, crumbled oreo, whipped cream & chocolate drizzle) and the Sweet N’ Salty Peanut Butter Shake (chocolate frosted rim with chocolate gems & PB cups topped with a sugar daddy, pretzel rods, chocolate covered pretzel, whipped cream & chocolate drizzle). These are just two of the eight shake masterpieces that are available. We were lucky to have a seat where we could look over to where the shakes were being made. What better entertainment! Dining at the Black Tap is an experience I am sure I will repeat and I recommend it to anyone. Food – A few days back I took the two-mile walk to one of the local Hard Rock Cafe‘s here in Singapore. This one is located at 50 Cuscaden Road, #02-01, HPL House, Singapore 249724. There is nothing really unique about this location, but I find visiting a Hard Rock Cafe while traveling is like taking a little step back home to the States. Sometimes it is comforting to see food just the way you are used to seeing it. This location is pretty large and is set up for live music. It even has an upstairs with more room for seating. I visited in the early afternoon, so there were not many other customers. I suspect that the place is much more crowded in the evenings and especially on weekend evenings. While they have a nice menu, I kept my order simple opting for the cheeseburger and fries. It was a very good lunch! I enjoyed reading this interesting article on a part of Singapore I had not heard of. I see that Haw Par Villa is closed now for repairs, but will open 3/1/19. When I return to Singapore after the Christmas Holidays in the US I will have to plan a visit to it. It only looks to be about 4 miles from where I am living. I am glad that I could ReBlog this post. Warning, this blog contains what could be some disturbing pictures for younger readers. No joke. Don’t let the references to Disneyland fool you. There are no sweet, happy endings at Haw Par Villa, only moral lessons featured often in very graphic, violent stories. Oh, and there are ghosts. You’ve been warned. There are so many ways to describe Haw Par Villa. Imagine a type of Disneyland built by two Chinese immigrants channeling Tim Burton then abandoned 50 years ago. If you prefer architecture or art, I could describe it as reminiscent of Antoni Gaudí and Salvador Dalí with a touch of Stephen King. Black Angus Singapore is the only franchised Black Angus steakhouse licensed by the U.S. Principal for the whole of South East Asia. Black Angus Steakhouses originated in the US in 1964 and have several US locations, though I have not visited any. I have enjoyed a very good burger on both of my visits to this Singapore location. They have a good menu to choose from with several Steak and Prime Rib options. I enjoyed my meal on both occasions and I am sure I will be going back. This is a nice place to have a casual, but very good dinner or lunch. Libraries – I like seeing blog posts about libraries and have made a few myself. 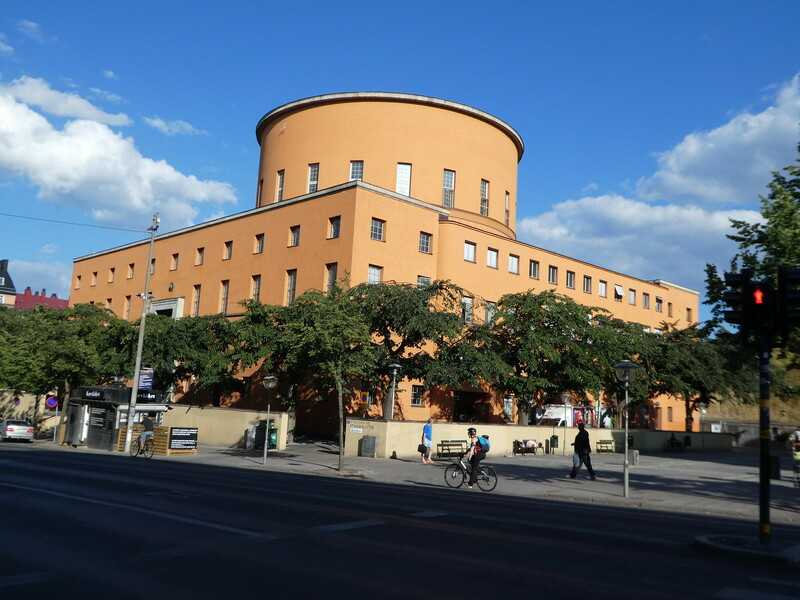 I enjoyed seeing this one of the Stockholm Public Library and wanted to share it. The post contains a little more travel info than just the library itself, but it is worth seeing another library I might want to add to my list of places to visit. Our final day in Stockholm and just enough time before heading back to the airport to fit in a visit to the Stockholm Public Library in Odenplan. I love visiting libraries wherever I travel and what a delightful one this was. 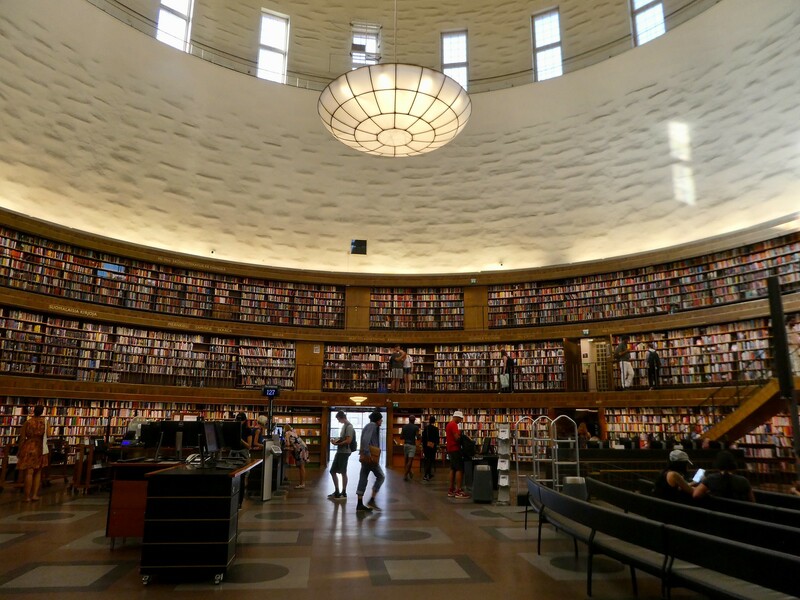 The library, which was designed by Gunnar Asplund and completed in 1928, is one of the city’s most famous buildings with its geometrically designed neo-classical architecture and is listed as being one of the world’s most beautiful libraries. Stepping through the Egyptian style doorway and climbing the central staircase, we were able to get our first glimpse into the central rotunda of the library. The rotunda is a circular book hall and is an absolutely stunning temple for book lovers like me. It contains a total of 40,000 books on three levels and retains its original mahogany furniture and leather chairs. Food – My wife and I walked over to a nearby Dean & Deluca location a couple of nights ago for dinner. While it looks empty in this photo, it is generally very busy. We were there a little early. This location is at ORCHARD CENTRAL, 181 Orchard Road, #01-09/10, Singapore 238896. It is one of three locations here in Singapore. We each ordered a pasta dish which we were pleased with, though I liked mine more than my wife liked hers. We decided to take one of the outside tables to be by the water feature and to be able to watch the people walk by. The highlight of the dinner was when this little fellow flew up and landed on our table. He sat there looking at us a short time them off he went. The restaurant is located in a large enclosed atrium that goes up five or six stories. We think this little guy came in through the large sliding glass doors, but we are not sure. The food was good, though not exceptional. Having this guest land at our table though will make the evening memorable. Want to Carve a Pumpkin? Can You Spare a Dime? So it is that time of the year where pumpkins are being purchased to be carved up into Jack-o’-lanterns. People are preparing for Halloween here in Singapore as in many other places around the world. When walking through a local grocery store recently I saw the prices in the photo above and they really made the higher cost of living here stand out. Now those pumpkin prices are in Singapore dollars, not US dollars, but they are expensive. Using Coinmill to convert the $39.90S for the large pumpkin into US dollars I get $28.99. Less, but far from cheap. Even the medium pumpkins at $26.90S are over $19.50 US. Far more than I am used to seeing at the HEB back in Central Texas. I checked their website and see “Fresh Jack-O-Lantern Pumpkins” listed for under $7.00 US. One of the local malls had a couple of BMWs on display a few weeks ago. If you can’t read the price on the BMW X2 shown above it lists the vehicle ‘from’ $152,888S ($111,070.11 US). While talking about autos, what does fuel cost? The prices shown on this pump don’t look that bad . . . until you realize that the price is per liter. Looking at the website globalpetrolprices.com the average price per liter of gasoline in Singapore over the last quarter was $2.22S with a minimum of $2.18S and a maximum of $2.28S. If we think in terms of gallons and US dollars the average is $6.10 with a minimum of $5.97 and a maximum of $6.25. About double, or more, what we see back in the US. Returning to the grocery store lets look at ice cream. You see here small 458 ml (essentially a pint) of Ben & Jerry’s for $13.90S and a 1.66 L (3.5 pints) of Tillamook for $19.95S. That is $10.10 and $14.50 respectively. They don’t have hamburger here, at least not as we know it. The closest is this Australian minced beef at $29.90S per kilogram. This is just over half a pound of hamburger for $5.70 or over $11.00 per pound. Eating out isn’t cheap either: a Three Meat Pizza for $27.90S ($20.25 US), a chicken sandwich for $17.90S ($13.00 US), a Philly Steak sandwich for 20.90S ($15.18 US) and gourmet hamburgers for $22.00-$26.00S ($15.98 to $18.89 US). So while it is beautiful here and the weather is quite nice, though a little warm and humid, it is an expensive place to live. Having said that, the same can be true for pretty much any island that has to ship in most items. While I have not been all over the island of Singapore, from what travels I have made I have not seen any land in use for agricultural purposes. In the grocery stores, you see many items imported from the US, Australia, Japan, and Korea. Food – A couple of days ago my wife and I walked over to the Goodwood Park Hotel for Afternoon Tea at the L’Espresso cafe. The hotel is located at 22 Scotts Road, Singapore 228221. This is not the first Tea I have been to in Singapore, nor is it the best (still have to post about that experience), but it was very nice. The Goodwood Park is a beautiful older hotel. The building dates from 1900 and has an interesting history. It is now one of Singapore’s upscale 5-star hotels. (Note the Ferrari we saw parked by the hotel the day we were there). The original building has been added to and modernized over the years. The hotel now offers 233 guest rooms and suites. We were headed to the L’Espresso cafe to have Afternoon Tea. We were actually seated a the table shown in the center of the photo. Established as a choice destination for English Afternoon Tea in Singapore, L’Espresso is a cosy café by day and a chic lounge by night, complete with a breezy poolside terrace area. This spacious and breezy terrace has also become an ideal location for wedding solemnizations. Since the 1970s, the English Afternoon Tea has earned a reputation for L’Espresso as the “place for elegant teatime pursuits”. The buffet spread is a dazzling assortment of dainty sandwiches, salads, savories, pastries, desserts, chocolate fountain and of course, traditional English scones. I was able to fill my first plate with an assortment of sandwiches, bread, shrimp and lasagna, among other goodies. Needless to say, during our two plus hour stay (most places serving Tea expect you to stay two hours or longer) I filled more than just this one plate. By the time we finally left to walk back to our apartment we were both stuffed and the Tea was our only meal of the day. From where we were seated we had a great view out onto the pool and courtyard. Of course, I had to go back one last time and pick up a few goodies from the dessert bar. They were featuring items in shades of pink the day we were there in honor of Breast Cancer awareness. This was a very tasty and filling afternoon. I would return there anytime, though I would want to plan in advance to that I could fast ahead of time. I would recommend the experience to anyone.